want to get the latest news, try our new toolbar for Internet Explorer and Firefox powered by Alexa. Feedback is welcome! The download is available in the right menu of the blog.cloud-client.info website. this hint is only for RDP connections between a IGEL Universal Desktop LX / OS and a Windows based Remote Desktop Server (for example Windows 2008 R2 SP1, not Remote FX) and if you got a bad audio quality (noisy/cropped). It can be used with different firmware versions, in my case i used the 4.10.100. Open the IGEL Setup and/or the profile and go to System->Registry->rdp->winconnect->sound-driver and change it to OSS. Apply the settings and restart the session to the Server, the result should be much better now. today i’ve tested Windows 8 to go together with an IGEL UD5 incl. the optional WiFi Add-On Food and here are the results. – one 750 GB USB 3.0 HDD running Windows 8 to go (x86 Version) incl. enabled Bitlocker drive encryption for the HDD. – Supported Hardware: Nearly every needed driver incl. the optional WiFi Food is coming with Windows 8 to go without the audio driver. Regarding VIA the audio driver is currently under development and will be available soon. – No issues if using Bitlocker Drive encryption coming with Windows 8 to go. 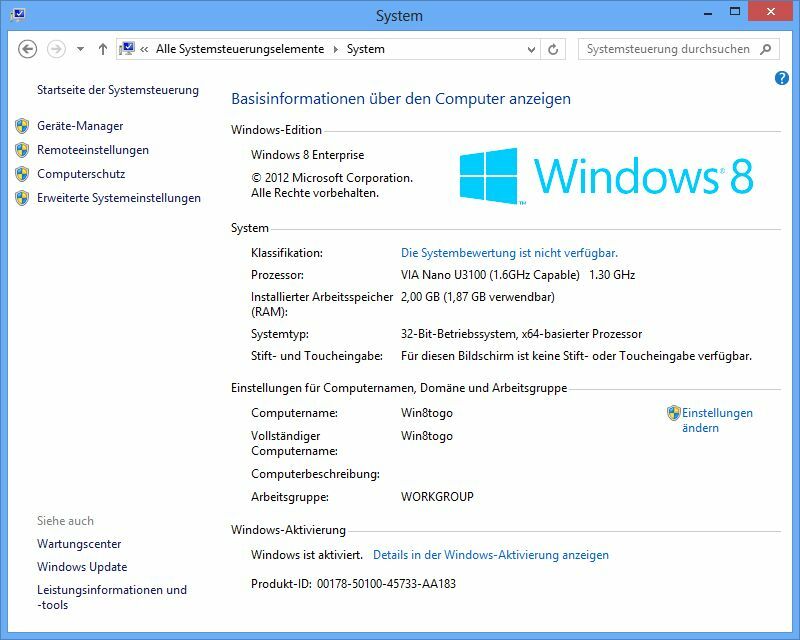 – You might be required to increase the RAM if you are not already using a Windows 7 based UD5, i tested it also with 1 GByte RAM and it works for me too but it’s a little bit slower and 2GByte of RAM is the Microsoft defined requirement to use Windows 8. – I don’t recommend to use a UD2 for this, a UD3 might provide enough perfomance but i would prefer a UD5 in any way…. I will check out a UD9 later incl. touch Screen but i suggest this combination will work too. – Very simple way to switch from a full managed to a none managed Windows based desktop without touching the original IGEL OS. – Mobile workers using Windows 8 to go can use a thin client as “fast to setup” workplace. – Guest workers can get a seperate full Windows workplace that is not attached to your environment in only a few minutes. – Lab environments to check/create Windows 8 to go based desktops/medias or need to switch the OS very fast to access or test other systems in the environment. So we have another available solution here… If i got some time, i will report a test here. today i migrated a HP t510 (VIA Eden X2 U4200 CPU) thin client with the IGEL Universal Desktop OS (UDC) 4.10.100. The hardware support includes the graphic card (VIA Chrome 9; fully supported but not official by IGEL) and are working perfectly for me incl. network card, USB ports and audio. USB Redirection and five things you should be aware…. 1) USB Speed: If you are not using a zero client with a USB 1.1 port (i call it speed limitation on hardware level), the most important thing is “speed”. Don´t try to redirect a device that require 36mbit/s / 4,5mbit/s (Blue Ray Burner single speed) thru a 2mbit WAN connection… It will not work stable. 2) Voltage: If using an old USB Harddisk, use the right cable (Y-cable if needed) and make sure that the USB port can deliver the required voltage or use an active USB Hub with a seperate power supply. If you’re using a thin client which is a low voltage device, check this out first! Also do not use USB christmas gimmicks or USB coffee cup heater together with a thin client or any other low voltage device (tablet computer/netbook). Low voltage devices in general don’t provide a 450w power supply which is able to compensate this..
3) USB devices mostly require a “stable” network connection to be redirected, if this is not available.. Be prepared to have some fun with the users! 4) A USB device which is redirected to a virtual desktop or somewhere else can not be used with the local OS, this applies especially for keyboards, USB network devices and similar. Redirecting a USB WiFi device is a bad idea if you´re using this device also for the local network connection (connections loss after connection to the VM is established), redirecting a keyboard is a bad idea if you want to use it local (alt+ctrl+del as sample will be processed only in the VM and not at the end user device). 5) For IGEL devices: Enabling USB redirection in general will not redirect all connected usb devices, you have to allow it seperatly by class or device id to prevent issues mentioned in 4). P.S. : A small extension… Try to use “real” USB redirection only if you’re really need it! Very often there are more effective ways to use a USB device in a remote session thru virtual protocol channels like for audio devices, memory sticks, printers or smart card readers. here are some settings that can improve the User experience for ICA sessions, mostly this is important for smaller devices like the old UD2 or UDC migrated old devices. All settings can be found in system->registry, please test the settings one by one and not all at the same time! Use on your own risk! Test in advance! Please note: This might improve the user experience but it don’t have to be, depending on the user scenario/environment! today we migrated a Dell Optiplex GX620 with the IGEL Universal Desktop OS Version 4.10.100. The inbuild hardware like the Intel 945G GFX Card and the NetXtreme BCM 5751 network card work’s like a charm (please note: You need the advanced feature set to enable native Graphic Card driver support!). if it is configured via the IGEL Setup. if all local made settings are written to the UMS. – Fixed problems with backup/restore of TS CALs. ethernet adapter is disabled in device manager.